In case you missed it, SF Giants catcher Buster Posey had his season ended via leg injury after taking a hard collision at the plate from Scott Cousins of the Florida Marlins. If you can find a replay of the collision, it looks like a run-of-the-mill home plate collision; something that is a legal move in Major League Baseball. Unfortunately for Buster, he ended up injured and out for the rest of the season. One would think, “Hey, its part of the game, and it happens.” But I know one man who thinks otherwise. Since the injury, Cousins has contacted Posey, to no avail, but has apologized both publicly and to the Posey family. So this should be behind us, right? Wrong. 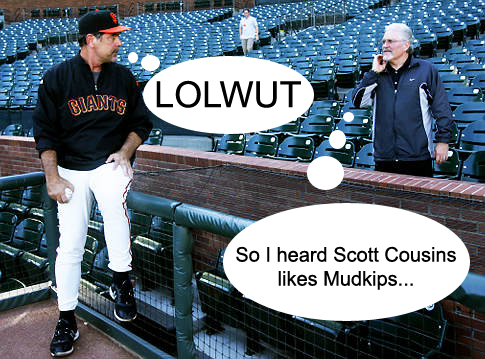 Giants GM Brian Sabean had some choice words for Scott Cousins on the radio in San Francisco, calling the collision “malicious” and adding “If I never hear from Cousins again or he never plays another game in the big leagues, I think we’ll all be happy.” Add that onto the fact that Cousins has been receiving death threats for his “malicious” play at the plate, and we’ve got a world-class instigator in Mr. Sabean. Hey… Brian… I may not have a lick of major league experience… But last I checked, you don’t have a lick of experience either. Do you know what its like to be in that situation? Do you know what goes on in the heads of both the runner and catcher? You sure talk like you do. Can you look directly into the lens of a camera, instead of hiding behind the microphone, and tell us all that Scott Cousins had it set in his mind to injure Buster Posey? Injuries happen. The right thing to do would have been to tend to your own player, and let the two of them “man up”, like Cousins has been trying to do. Instead, you look like the same irresponsible buffoon who, according to that controversial investigation, knew he had a ‘user’ on his team and kept his mouth shut so he could keep the cash flow running thanks to Señor Shrinky Balls. lolwut!? Did you not hear what you said on the radio as you said it? The guy is receiving death threats, and what you said shows no ‘ill will’? How in the world did you become a major league GM with that kind of etiquette? Either way, you’ve got a lot of apologizing to do, and you need to start with Cousins. Sorry, Giants fans, he’s all yours. Minaya might have been a mental case when it came to controlling in-house antics, but he was very careful with his GM-to-player public statements.